Marijuana policy continues to roil New York, a US territory is on the verge of legalizing it, marchers protesting the killing of Keeven Robinson by Louisiana narcs demand justice, and more. Georgia Poll Has Solid Majority for Marijuana Legalization . 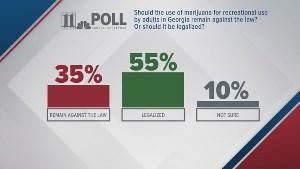 A new Survey USA/11 Alive News poll has a solid majority for legalization. The poll found 55% in favor, with 35% opposed and 10% undecided. The level of support for legalization is up seven points over the last time the question was polled two years ago. New York Legal Marijuana Could Generate $3 Billion in Revenues, Report Finds . New York City Comptroller Scott Stringer released an analysis Tuesday estimating that the adult legal market for marijuana in the state could be roughly $3.1 billion. Sales at that level would net as much as $436 million in tax revenues annually, including up to $335 million for New York City alone. Manhattan DA Announces Plan to End Small-Time Marijuana Prosecutions . Manhattan District Attorney Cyrus Vance, Jr. said Tuesday that his office would stop prosecuting people for smoking or possessing marijuana as of August 1. There would be an exception for cases where there is a clear public safety concern. Vance said the move was part of a broader effort to end the city's wide racial disparity in marijuana arrests and prosecutions. Northern Marianas Senate Approves Marijuana Legalization Bill . A bill that would legalize marijuana and allow for legal, regulated, and taxed marijuana commerce passed the Senate of the Pacific US territory on Wednesday. The bill now goes to the House. If approved there, it would then go to the desk of Gov. Ralph Torres (R). New Jersey Bill Would Expand Medical Marijuana System . Responding to Gov. Phil Murphy's (D) call to reform the state's medical marijuana program, a trio of state senators has filed a bill that would allow more dispensaries and grows to open, as well as permitting more medical professionals to recommend the drug to their patients. The bill, Senate Bill 10, is not yet available on the legislative web site. Louisiana's Jefferson Parish NAACP Calls for Arrest of White Narcs Who Choked Black Drug Suspect to Death . As hundreds of protestors marched Monday night through East Jefferson to demand justice in the death of Keeven Robinson, 22, local NAACP head Gaylor Spiller called for the four white undercover officers involved to arrested on murder charges -- and not be placed on paid vacation while awaiting resolution of their cases. Four Jefferson Parish narcs chased Robinson through back yards and over fences before subduing him and leaving him dead. The parish coroner reported Monday that Robinson's death was a homicide caused by compression of his neck during his arrest. He was unarmed. British Nurses Call for Legalizing Medical Marijuana . Members of the Royal College of Nursing have voted overwhelmingly in favor of lobbying the government to legalize medical marijuana. The nurses argued that if drugs such as morphine and fentanyl are legal, medical marijuana should be, too.